We hope 2019 is full of new and exciting opportunities for your business. 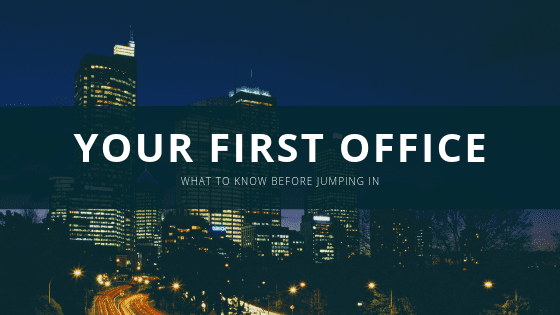 If finding your first office is one of them, let’s get started. One of the most important things you need to know is if your business ready for an office? This is a must. The big three: Space. Place. Budget. Consider how you’ve been getting on in your current space – what is and isn’t working for your team. A good way to do this is to simply track your daily business routine. You’ll discover how often you use meeting spaces, how important a reception area is to your business, whether you need private offices, parking spaces, and the level of security your building requires. You’ll want to think not only of your staff, but also your clients. How often will they visit your office? Will they require parking when they do? If you’re currently working from a home-based office or co-working space, does your team tend to favour a common area, or do they prefer to find a quiet place unto themselves. Do you break at the same time, share meals? Don’t overlook the importance of recreating this experience in your first office. It doesn’t have to be exact, but the idea of an inviting space where everyone can spark casual conversations and refresh their minds is likely contributing more to the success of your business than you realize. Prepare a list of ‘need’ spaces and ‘want’ spaces. What you think you need and what you actually need may be quite different. A list of non-negotiables will save you from debating offices that ultimately prove to be deal-breakers. If you’re willing to share your first office, serviced buildings can provide a professional space in a premium location along with an opportunity for future expansion within the same building. They may also include communication services, furniture, equipment and maintenance packages, which can be a great way to test the waters for a first office. If, however, you’re confident that your business is stable, and you’re looking to establish roots, you’re better off to lease – or even buy – your first office, to invest in a place you can call your own for years to come. Your business is as much about what it sells as the values it projects. So try to choose an office space that projects those same values. Whether it’s trendy or traditional, cost-effective or high-tech, a new space should give you the right feeling as well as tick all your ‘need’ space boxes. Your new office should make you feel happy. You will be there almost every day. To achieve this, you may consider creating a collective vision board. Your board may include inspiring office pictures, material samples, or it may be more abstract with small objects and other images, provided they mean the same thing to everyone on the team. Post it in a central area within your current workspace so everyone is influenced by it every day. If your team doesn’t share a physical space yet, you can use an online tool like Pinterest or Trello to create a digital vision board. A shared vision of your first office, will create excitement that gets everyone on board. If you’re really at a loss to determine the size, type or layout that’s best for your first office, a commercial real estate agent can arrange for a few office tours. This will give you an idea of how different office environments function. A professional realtor can also help you negotiate contracts and protect your interests. If you’re moving into a new city, you’ll need to find a reputable agent who knows the area. Whomever you hire will become an extension of your team and you should vet them as you would any employee. You can ask for referrals from colleagues or use a large brokerage with offices in both your current and desired locations. If people are moving along with the business, you may also need to enlist a professional relocation service to help your employees transition and find temporary accommodations. Whether you are moving far or securing space within your current community, choosing a location for your first office (and any office thereafter) should be done strategically. For example, close proximity to clients, competition, or transit may fit your overall plan. How long you plan to stay – based on forecasted growth – will impact your requirements. You don’t want to overcommit yourself, but at the same time, you don’t want to be searching again in six months time if you are just getting settled. Remember what the impetus was for finding your first office. But, remain flexible if you can. You may be surprised at what you can find in an area adjacent to your target location. Neighbourhoods are changing all the time. A good realtor will have insight into the current market and an outlook for the future. It’s up to you to decide whether it aligns with the future of your business. It goes without saying (but we’re saying it anyway because it’s important) that a first office adds many costs that you aren’t currently managing. These are real expenses, due every month, and you need to be able to afford them even if business slows. You may think it’s OK to stretch your initial budget for a great office, but what is the reality of that choice? If it involves cutting staff to maintain profit during a slow sales period, you must reconsider. Let the budget guide you. Be responsible and your office will benefit in the right time. Have a plan-B budget if possible. One that opens up some additional spending – by either bringing certain services in-house, delaying furniture upgrades, leasing instead of buying new equipment, or doing without amenities that aren’t key to job function or job satisfaction. This will help open up your options. When establishing a budget for a new office, Entrepreneur advises: shy away from calculating price per person and instead focus on how much you’re willing to spend monthly, all-in, for your team. And cautions you to calculate costs like utilities, furniture and other office fees, which can add up when you’re starting from scratch. Nothing will benefit you more than taking the time to search and compare. Don’t rush the decision or even start looking before you are ready. You may feel pressured to make a decision before you know exactly what you need and can afford. You’ve managed to grow a successful business up to this point. Waiting even a few months is not worth risking financial hardship or signing a lease when you’re already planning to move on as quickly as possible. If there is a looming deadline, like an important meeting, you can always book a conference room in a nearby hotel or office. Your clients will appreciate your considered approach to all aspects of your business. Finally, you should prepare yourself for the possibility that you may not find your ideal office within your timeframe. But don’t let that discourage you. It’s worth waiting for the right office. And you still have options. You can reassess your current position and decide whether to keep looking, or if you’ve seen all there is to see for now and put the move on hold. You can reconsider your list. Or find the right office for right now, which may mean staying where you are, or moving to a transitional space while you watch the real estate market. Moving into your first office will almost certainly boost employee morale. It means you are growing. Show things are headed in a positive direction by choosing an inspiring first office space. We’ve been moving small businesses and startups into their first, second, and third offices for nearly fifteen years. When the time is right, we’re ready to help you do the same.